Backpackers and backpacking seem to be inspirational for many authors, and Tamara Sheward has apparently taken the inspiration and worked it over well, if the glowing testimonials on the back cover are anything to go by. 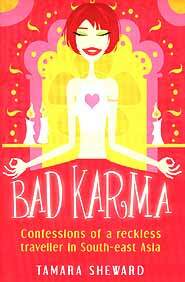 The full title being “Bad Karma, Confessions of a reckless traveler in South-East Asia” probably says it all. If looking for it, ISBN 1-84024-058-X, Summersdale Publishers 2005 will help. Being Australian, and a self-confessed ‘wild child’, Tamara Sheward epitomizes the young and headstrong, pushing their way to maturity down the long hard road of (backpacker) experience. The answers to the hordes of questions (mainly unasked) by tyros considering SE Asia were described as, “I should have known in the first place to look for answers where they are normally found. In the bottom of a beer glass.” The brewing industry in Australia (or the world, for that matter) will always prosper with the legions of Tamara Shewards coming forward from the sunburned country. The book chronicles Tamara and her mate El’s exploits traveling through Thailand, Laos, Vietnam and eventually Cambodia. For an Australian writer, I was surprised at her not mentioning that the Friendship Bridge from Thailand to Laos was built with Australian money given by the self-styled “World’s greatest treasurer” Paul Keating (also their ex-PM). That she calls it the “Animosity Bridge” shows how the original high-flying concept has failed. She and her friend El appear to be continuously ripped off by anyone in authority anywhere, and many pages are given up to El’s vitriolic rejoinders. At no stage is there any semblance of understanding of national cultures. I found this a really tiresome book. Sheward is a good writer, with a self-deprecating wit that does engender the occasional titter, but anyone on the wrong side of their 21st birthday will very quickly become tired of the relentless descriptions of hangovers and the two women’s inability to meet any form of culture shock without gulping down Valium, despite Sheward claiming, “I’ve only ever tried Valium once in my life, and it, along with the aid of six Southern Comforts led to a disastrous chain of events culminating in my passing out in an airplane toilet for four hours. Not that I remember any of it. I was filled in by my fellow passengers after the stewardess had broken down the toilet door and dragged me snoring back to my seat.” Having been an “occasional journalist” as Tamara Sheward is described on the back cover, it sounds to me that Ms Sheward remembered the hack journalist’s creed of never letting the truth stand in the way of a great story. Getting High on Hyperbole should perhaps have been a more fitting subtitle for this paperback. At B. 495, it will never grace my bookshelves, even if it does grace those of Bookazine. Her subsequent books, when she has matured, will make amusing reading. This one does not, despite Yasmin Boland’s assertions that, “Every sentence sizzles with humour.” Do not believe it! Remember the old adage, “Believe 30 percent of what you read and 50 percent of what you see” (Lang Reid, 2005). The only official album released during Jeff Buckley’s far too short life was Grace in 1993. Grace was a very apt title; in fact it could have been called Complete Grace or Perfect Grace, as the album was both complete and perfect in every way. Jeff Buckley was the son of folk hero Tim Buckley, whose life was snatched away from the world in 1975 when the singer/songwriter was only twenty eight years old, leaving behind a young nine year old son Jeff. Therefore it makes it even more heart rendering that the young Jeff was taken from us in 1997 after an afternoon swimming in a seemingly placid lake when his time was literally swept away. Jeff Buckley was only thirty one when he died, but had so much more to offer the world both as a musician and as a human being. Jeff Buckley went into the studio to record his first full length album in 1992. So far there had only been the four track EP Live At Sin-e with producer/engineer/guiding light Andy Wallace. Andy Wallace was nicknamed ‘The Fist’ due to the necessity of keeping the young Buckley’s mind focused, as Jeff was nothing if not a wandering spirit. Jeff Buckley brought along as his band Mick Grondahl on bass and Matt Johnson on drums. And although Michael Tighe was to only play guitar on one track on Grace, he was to join the band full time once they hit the road after the recording was finished. The combination was to literally strike sparks. On the completed album, ten tracks were selected from those recorded, seven originals, two co-written by Jeff Buckley and Gary Lucas, one with Michael Tighe, one band composition (the closing Dream Brother), three Jeff Buckley solo efforts, and three perfectly selected cover versions. It is perhaps surprising given Jeff Buckley’s undoubted all round abilities that on first listening it is the cover versions that stand out. But then when you look at the standard of songs that were chosen maybe not. J. Shelton’s Lilac Wine is the first of these songs that come up in the album’s running order. Jeff Buckley sings the song with very little accompaniment; the very loose strum of an electric guitar and the guiding caress of the rhythm section during the verses is all that is needed. Such is the song’s beauty that it will bring even the most rowdy room to stillness as people listen to the power of Jeff Buckley’s voice. Hallelujah from the Leonard Cohen book is a song that Jeff Buckley took with his band and turned into his own after the release of Grace. The Jeff Buckley Band would always close their main set with a rousing version of Hallelujah, which again has very sparing, but telling musical backing to a wonderful Jeff Buckley vocal tour de force. The song is sung with such great emotion you are dragged along with it, all quite involuntarily, such is the strength of the performance. Benjamin Britten’s Corpus Christi Carol (For Boy) with its church-like undertones, shows off yet another facet of Jeff Buckley’s voice, leaving the band very little to do but accompany their leader as sympathetically as is possible. This is immediately followed by the Jeff Buckley Grunge Rock classic Eternal Life (this has perhaps been granted to the band by this song alone), when the band members are given their musical wings and allowed to soar like some deranged eagle into the sky. Mick Grondahl’s bass is right at the front of the mix, whilst Matt Johnson thrashes away at his drum kit, and Jeff Buckley slashes away at his guitar. The vocals make it hard to believe that this is the same singer who only seconds previously had been singing like a choirboy, now sounding like a gutter rat. This is without doubt a Garage/Grunge Rock classic, something to really thrash your head too. As the feedback drains from the last guitar chords the album’s final song, Dream Brother, sends shivers down your spine. The band gels perfectly, lulling you away into the sunset with a crafted song that combines all the elements of the previous nine songs; a fitting conclusion. The album opener, Mojo Pin, introduces you to all the different faces of the band with sculptured chorus and verse hung around a middle section that fairly rocks. The next song, the title track Grace, is everything you would by now expect from the band. It is concise and without a wasted note or emotion. Last Goodbye is a fine American anthem that would stand proudly in any catalogue by the likes of Springsteen or Mellencamp, which does gather extra dynamics as it leads so well into Lilac Wine. Following this is So Real, a fine riff oriented song that benefits from one of the most gut wrenching solos ever slung down in a recording studio. Michael Tighe pulls all the plugs on this one and deserves his writing credit for the guitar solo alone. Lover You Should’ve Come Over is the perfect dirty love song set up by a certain amount of youthful innocence, not trying to excuse lust, just making an impassioned plea in its defence. Grace was the only album released during Jeff Buckley’s lifetime. Fortunately for us, the fans, there have been two more releases. The first was Mystery White Boy - a collection of live recordings from 1995-1996 including some stunning versions of songs from this record as well as some new compositions. This is naturally given a dramatic conclusion with a rendition of Hallelujah, allowing us to hear what the songs sound like after a couple of years of road work with Michael Tighe now well established in the band on dual lead guitar with Jeff Buckley. The second release is a selection of songs from various recordings Jeff Buckley had made prior to his death. This includes basic demos for his second album which he was about to record at the time of his death titled Sketches Of My Sweetheart The Drunk, which is the title of this two CD set. Obviously these songs are not in their finished state, but the Buckley magic drips through every pore. If you somehow missed out on the magnificence of Jeff Buckley, it is easy to rectify that by getting yourself some Grace.